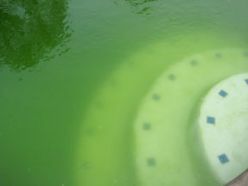 Every pool owner has once experienced a green pool. Either upon opening your pool for the upcoming season, returning from a nice family vacation or even just waking up one morning and your pool walls have green slimy growth on them. If you are a pool "newbie" - No need to panic, it happens even to the best of us. Who's the culprit? Algae! Pea green, forest green or slimy walls are some of the most feared pool water problems an owner may have. But not to worry, we know how to fix it. What is Algae and how did it infest my beautiful pool? Algae are an aquatic micro-organism, small plants that grows in water. Like all plants algae use photosynthesis to grow, meaning that on very sunny days it has the potential to grow extremely fast. Using chlorine to sanitize the pool water kills off all bacteria as well as the small algae that are beginning to grow. If your pool has algae odds are the chlorine concentration in the water was not high enough to stop this pest dead in its tracks. Once that initial small amount of algae is formed, it spreads rapidly and after a sufficient amount it turns the pool water green. Now that I know what Algae is, how do I get rid of it? Getting rid of algae is simple, but requires a bit of elbow grease. As mentioned above, having the right chlorine concentration will kill off algae before it has time to form. Now that your pool water is green and there are algae in it, all that is required is a greater concentration of chlorine than normal to make the green go away. In cases where the pool wall and stairs have a slimy coating, we recommend scrubbing the walls with a brush prior to adding your dose of chlorine. This will move the stuck on algae into suspension allowing the chlorine to have a much stronger effect. In the more extreme cases we also recommend the use of an algaecide on top of the chlorine to get rid of the more stubborn algae that seems to just not want to leave. Some of you may have the right chlorine concentration but still have algae growing only in certain isolated spots on the pool floor or wall. Most of the time this is a circulation issue, meaning the water circulation isn't reaching those specific spots. To fix this you simply have to redirect your return jet. The most common misalignment of the return jet is that it is positioned to high. If you can see the water ripple you should lower the aim of the return downwards until the ripples are barely visible. The nature II purifier is a major game changer when it comes to pool maintenance. This purifying system uses a mixture of minerals to fight algae specifically. Using the nature II will allow your pool to keep a lower than average chlorine concentration but still be able to fight algae. This is a big bonus since it reduces the work required to keep your pool crystal clear as well as save you some money as you are using less chemicals. We are so confident in this system that if your water is properly balanced and it turns green, we will give you the products you need to clear it up free of charge!